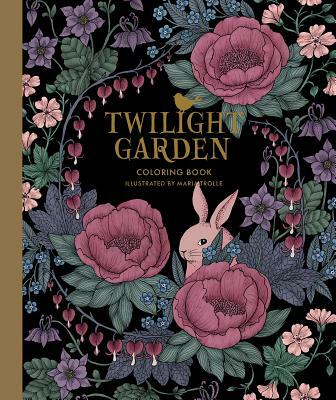 Maria Trolle's Twilight Garden coloring book collection sets itself apart from the competition with its romantic sophistication. Striking black endpapers and white-on-black printed imagery dispersed throughout lend this hardbound edition a luxurious feel. Artists will fall head over heels for Twilight Garden Coloring Book's 96 pages brimming with lush gardens, flowers, vegetables, and fantastic creatures common to a Scandinavian landscape. Deer, hedgehogs, kittens, sparrows, rabbits, and more can be found hiding withint the flora of this coloring book. Complete your collection with the Twilight Garden Artist's Edition, featuring twenty oversized art card drawings to hang on one's wall or share with friends. Twilight Garden 20 Postcards are ideally priced and perfectly sized. Maria Trolle is a graphic designer and illustrator living in Tyres , outside Stockholm. Her passion for gardening acts as a thread to her art, with plants, vegetables and flowers offering daily inspiration--preferably from her own garden.